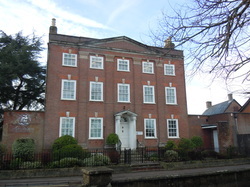 This is the front of Greyfriars you will see from Christchurch Road, but entrance is down a narrow, one way road to the left side of Greyfriars to the linked building shown in the picture at the top of this page. Our Rapidplay is in this more modern building. End of the long wall and free parking in this Greyfriars car park to the right of the picture. 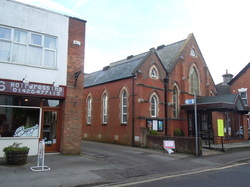 The building just visible on the left is Ringwood Library with its own free parking. The road is one way and you would need to go round in quite a long loop to get back to Greyfriars. 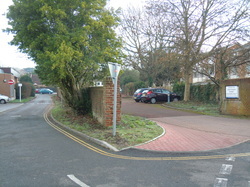 There are 2 main public car parks in Ringwood, the largest is the "Furlong" about 10 minutes walk away and near the A31. 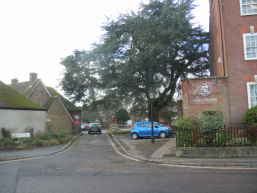 The second car park is much closer to Greyfriars. If you pass with Greyfriars on your left, this picture shows the somewhat obscure entrance to "Blynkbonnie" car park, about 150 yds along Christchurch Road. The car parks come under New Forest District Council, who unfortunately charge 7 days a week.